Tropical Storm Irene washed out many undersized culverts and bridges in vermont. 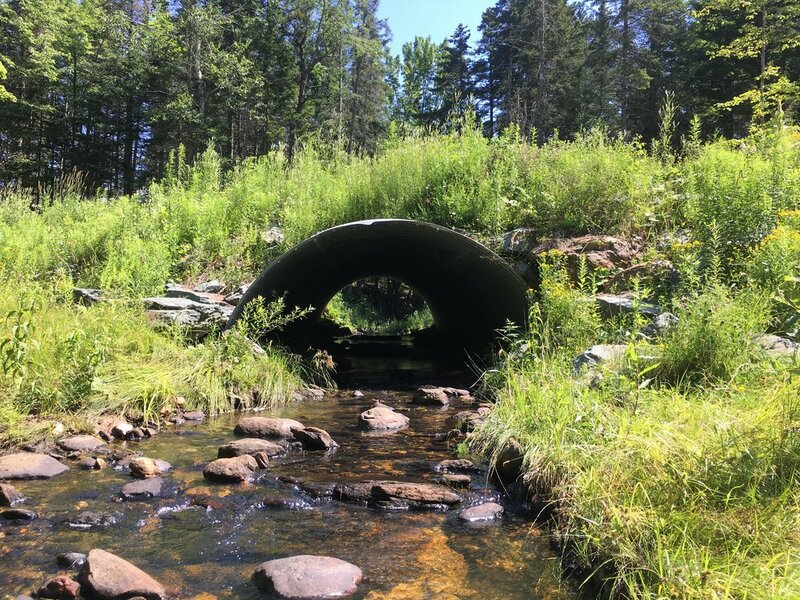 the white river partnership, working with the town of rochester and other partners, lead an effort to install larger stream-crossing culverts, like this 14-foot-wide pipe arch at oak lodge road on howe brook. this properly sized structure restores the flow of the brook and protects roads downstream. Yesterday, driving home from Massachusetts, I listened to two hours of radio reports tracking the destructive path of Hurricane Irma from the Florida Keys up the state’s west coast. I remembered the many lives upended six years ago in Vermont by Tropical Storm Irene, and I reflected on the many lessons Vermonters have learned about the relationship between development and waterways since Irene. Since Tropical Storm Irene, Vermont communities have been rethinking how our developed areas and farmland relate to our waterways, to avoid soil erosion and flooding. Farmers are using no-till practices to build soil health and avoid losing soil during spring flooding. Watershed groups are hosting tree plantings along streambanks. Vermont Youth Conservation Corps crews have improved vulnerable sections of Class 4 forest roads. Town road crews are designing culverts and bridges to withstand bigger rain events more prevalent with climate change. A UVM study released on the five-year anniversary of Irene, last year, found floodplains and wetlands along the Otter Creek below Brandon diminished property damage in Middlebury over 80%. The study concluded Middlebury saved up to $1.8 million in flood damages during Irene and has saved $126,000 to $450,000 per year since then from other flooding events. Floodplains and wetlands are valuable. Last week The Atlantic reported on a study published August 31st in Scientific Reports which came to a similar conclusion. The study quantified the benefits of coastal wetlands in the northeast during Hurricane Sandy, which struck the New Jersey coast in October 2012, almost five years ago. Researchers concluded wetlands avoided $625 million in direct flood damages during the storm. The wetlands mostly protected against storm surges rather than inland rain, which was more the issue in Irene. The savings were particularly dramatic when wetlands were located near expensive infrastructure on the coast of New York and New Jersey. This morning, David Green, the NPR host, remarked about the many new condominiums that have been recently built on the water in Tampa and asked Mayor Buckthorn whether there was a lesson to be taken from the storm. The Mayor responded, “This is Florida. People want to live on water. And they will continue to build on the water.” He called for a federal infrastructure bill to help build that infrastructure to standards that withstand storms of this magnitude. I hope more reflection will allow Tampa to reconsider the full cost of building up to the water’s edge and take advantage of the powerful savings inherent in natural infrastructure such as coastal wetlands. Adjusting development patterns based on the lessons of the storm would be more frugal and would, indeed, reflect government at its best.